Piggies rock! So does Boynton. Through her eyes, her words, her music, and above all her art, we see the world with whimsy and pleasure, appreciating round noses and curly tails, floppy ears and pleasing plumpness. And we’re lucky to give that gift to our youngest children. 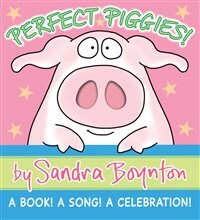 We are all perfect piggies and we know what we need. It’s really very simple, very simple indeed: a troughful of food, a place in the sun, and a little bit of comfort when the day is done. That goes for the rest of us, too.